Windows Task Manager, among other functions, allows you to stop applications and processes that are interfering with the Windows operating system or particular programs and applications. This is particularly pertinent when malware infections are running. You can find them in the Task Manager and stop them then remove them. Often, malware processes that are actively running will not be quarantined by many antivirus programs. What happens if Ctrl+Alt+Del will not work? If you are unable to open Task Manager from the start menu because a virus has locked you out, how do you open it? This article gives you six different ways to ensure access to the Task Manager so that you can stop malware processes and take back control of your PC. For some time, the familiar three-finger tactic of Ctrl+Alt+Del would bring you directly to Windows Task Manager. That was the case until Windows Vista was born from the Microsoft womb. Now it simply brings up a Windows Security Screen presenting five options, one of which is Windows Task Manager. As stated previously, malware can block this tried and true tactic, though it is reasonable to try this first. 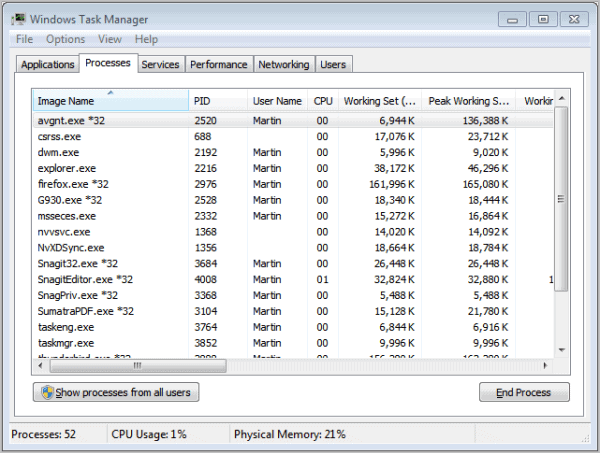 The easiest method for opening Windows Task Manager is to right-click the taskbar and then select Task Manager. This is a two-click method, but you can also create an Automatic HotKey that will bring up the task manager with a single key click. You can download a free utility for this: AutoHotkey download page. All information is included to create a HotKey for Windows Task Manager, or any other application. The next option is to use the Run command. At the Start Menu, select All Programs and then under Accessories, click the Run command. Type taskmgr and press Enter. The Task Manager opens. Ctrl+Shift+Esc will bring up the Task Manager as well, at least on most versions of Windows. This is your next bailout. If all else fails, you can use the lengthy method of browsing to taskmgr.exe. Navigate to C:\Windows\System32\taskmgr.exe. Double click taskmgr.exe and you are in. Finally, create a desktop shortcut to access Task Manager. Do this in addition to creating a HotKey. That gives you two quick default access methods. Simply right-click on your desktop and select New and then click Shortcut and a window will open. Follow the same path as above: C:\Windows\System32\taskmgr.exe. Click Next and type a name for the shortcut then click Finish to conclude. This will create a desktop icon allowing you to immediately open Windows Task Manager in the event of malware infection or any other reason. I highly recommend this and the HotKey approach. They are the fastest ways to open Task Manager when it is impaired by malware. Follow these steps and you can’t fail. You will trick any virus and be able to stop malware processes and effectively remove the malware using your antivirus software. Martin's Comment: Please note that there may be malware that blocks the task manager completely, so that not the access method, but the program itself cannot be opened by the user of the operating system. Your best in such a situation is to scan the system with antivirus software like Avast, Microsoft Security Essentials, AVG or one of the commercial solutions like Kaspersky, Symantec or BitDefender. And if I get a virus that’s executed, I would use Avast’s Boot Time Scan. By doing this Avast! can scan for malware before Windows boot-up. It can also detect viruses in Windows drivers because Avast! does not rely on Windows drivers and uses it’s own drivers for disk access. Thank you for your comment, Avast employee! One thing that can be tried also is open it in safe mode. Don’t forget the awesome Process Hacker and System Explorer too plus they are portable as well. Good thing I don’t write malware, or else All your base are belong to me. Anyways, that is rare thankfully. So yeah most of the tips in this guide will work 90% of the time. And using process explorer works near 99.999% of the time. Seems like most malware authors are idiots and don’t block it. Thanks for the info. If Task Manager was disabled by a virus and still won’t open after you have removed the virus there are several tools that will fix it – an easy one to use is SuperAntiSpyware (SAS) Free edition and there is a portable version so it doesn’t even need to be installed. Run SAS then select Preferences to open the SAS Control Panel and click the Repairs tab to show a list of possible repairs – including Enable Task Manager. The other repairs can be very useful after virus attack too e.g. repair System Restore service, IE security zone reset. All good up to a point , but it doesn’t cover the most commonest situation with malware. That is that Task Manager WILL run, but minimised in the system tray, and will not open to the full window. Apparently , if you run task manager with administrator rights , it will open ( in this case, you can open ” msconfig ” in the same way ). Maybe is just on my laptop , idk. I tried all methods suggested by Ms. Gross and still failed. The laptop is still frozen. Mobility of touchpad mouse still works but clicking does not. Ctrl works, func. f6 and func. f7 work, caps lock works, num lock works and the rest of my keys show no evidence of functioning. No suggested button combo has worked. External usb mice have had no effect even though usb speakers have responded to being plugged in just fine. Pressing down on the power button is the only way I have found to escape the nightmare until turning it on to try again and fail again. Hi Kent, awesome! Didn’t know that! @josjewie you can see your an administrator by looking in the title bar. If it says “Administrator”, then it is! I used to use runas /user, but that didn’t work always. Even right click and choose Run as administrator, as described here https://www.itexperience.net/2018/12/02/run-as-administrator-how-to/ didn’t always work.